The playing of music or sound makers can only be used during pre-game, time-outs, between the games, and after the match. Artificial noise makers are prohibited. Reason the change...This rule provides direction for deciding when sound effects are appropriate. Not allowing artificial noisemakers helps prevent fans from unsporting actions and interfering with play. If a back row player completes an attack by contacting the ball completely above the height of the net and the back row player is on or in front of the attack line, this is an illegal back row attack.Reason the change...This rule clarifies what a back row attack is. 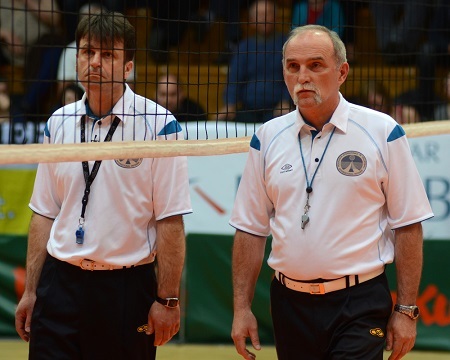 The head coach must be seated by the time the referee starts to raise their arm to signal for serve.Reason the change...This rule gives direction to the coach of when they need to be seated. Bare midriff tops arent allowed. The uniform top must hang below or be tucked into the waistband of the uniform bottom.Reason the change...Uniforms that expose the midriff are inappropriate for high school volleyball. Jewelry cant be worn in warm-ups or during the game. A player wearing jewelry during warm-ups should be instructed to remove it without penalty.Reason the change...Players are prohibited from wearing jewelry to minimize risk. The numbers on the uniforms can now have a different color of trim from the body of the number as long as the color is in sharp contrast.Reason the change...This rule change is in effort to make the visibility of the uniform numbers more clear. If an illegal libero replacement is discovered, this is considered illegal alignment and loss of rally/point.Reason the change...This rule clears up any confusion about a penalty for illegal libero replacement. This creates another opportunity for the libero to participate in the game. Also, the libero is often one of the better servers on the team. The assistant scorer should notify the umpire of any illegal libero actions (illegal replacement, wrong serving order, etc. ).Reason the change...New rules for the libero, needed to be changed to coincide with the libero now being eligible to serve. Libero replacement cant take place during a re-serve.Reason the change...A re-serve is part of an attempt to serve. This rule is consistent with requests for substitutions, time-out and rotation check  no requests shall be recognized until after the ball has been served. The libero replacement must be completed during a dead ball and before a serve.Reason the change...All players should be in place prior to the whistle for service. The replacement can take place after a timeout as long as the replacement has sat out a play.Reason the change...This rule clarifies that a replacement cant take place during a timeout, only after the timeout is completed. If an illegal replacement is discovered before the whistle for serve, an unnecessary delay is charged. If the illegal replacement is discovered after the whistle for serve, illegal alignment is called.Reason the change...Based on the timing, there are two different penalties for illegal libero replacements. Officials mechanics for signaling point is now indicated by the official extending their arm in the direction of the team that will serve next.Reason the change...With rally scoring, there is no need to signal point. This revised signal indicates the team to serve next and also the team to receive the point. A uniform number of each starting player is listed on the line up sheet in proper serving order. When submitting line ups, teams no longer use the player floor method.Reason the change...Scorers sometimes have a difficult time conveying the correct order of the lineups to the scoresheet when the starters are listed in floor position. By listing numbers in serving order, the lineup matches the scoresheet and will reduce problems transferring the lineup to the scoresheet. Officials may not use television or electronic equipment to make game decisions.Reason the change...Restrictions related to officials making decisions based on the use of electronic equipment needs to be addressed as new devices become more available. Officials may wear black shorts due to heat issues.Reason the change...If weather is extremely hot and humid early in season, high school volleyball rules permit officials to wear black shorts. The officials uniform consists of all white collared polo shirt, black slacks, solid black athletic shoes, and black socks.Reason the change...High school volleyball rules no longer require officials to wear striped shirts.